Do you want to be challenged to deepen your understanding of the characteristics and requirements of Almighty God? The Understanding God Series contains the bulk of Pastor Tony Evans' compelling and hard-hitting resources on the essentials about God, Jesus Christ, the Holy Spirit, Spiritual Warfare, and prophecy. Now available in paperback, readers will not want to be without a single book in the series by this popular and powerful speaker and author.The Bible's prophetic passages do far more than simply satisfy our curiosity about tomorrow. They're supposed to impact our lives today. In this compelling book, Tony Evans explores the crucial topics of prophecy - including Heaven, Hell, the Tribulation, and the Anti-Christ. Readers will come to understand how prophecy shapes our lives today. 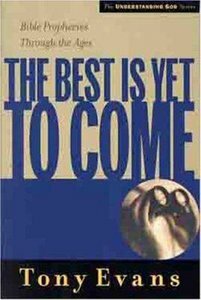 About "The Best is Yet to Come (Understanding God Series)"
16. What Happens When We Pie? 17. What Is Heaven Like? 18. What Is Hell Like? 19. How Should We Live Today? DR. TONY EVANS is the founder and president of The Urban Alternative, a national ministry dedicated to restoring hope in personal lives, families, churches and communities. Dr. Evans also serves as senior pastor of Oak Cliff Bible Fellowship in Dallas. He is a bestselling author of numerous books and his radio program, The Alternative with Dr. Tony Evans, is heard on more than 500 stations every day. For more information, visit: tonyevans.org. All of us are familiar with the story of Humpty Dumpty, the figure from the children's nursery rhyme whose world was shattered after he had a great fall. He called on the best his world had to offer to address his problem-"all the kings horses and all the king's men." But the tragedy of the story is that none of these human powers could put Humpty Dumpty's life and world back together again. Apparently Mr. Dumpty had no biblically functioning church available to help him, because if he had he would not have had to call on the king in the first place. Now its one thing when a nursery rhyme character cannot find the help he needs to repair his shattered world, even when his problem is being attended to by the highest authorities the culture has to offer. But it's another thing altogether when real people in the real world discover that all the king's horses and all the king's men-can't fix society's deepest problems and address the people's deepest needs. This is where the church comes in, because the church is the most important institution on earth. The church, and only the church, has been commissioned by the sovereign Lord to be His representative agency in history.